Virtual worlds represent an important new modality of human interaction. The discussion will focus on emerging forms of popular culture in virtual worlds, the promise of ethnographic methods for studying these emerging forms of popular culture, and the broad social implications of their emergence. A virtual world is a computer-based simulated environment inhabited by avatars. Avatars are computer users’ representations of themselves or alter egos in the form of a three dimensional model, a two dimensional icon, or a text construct. Communications between users range from text, graphical icons, visual gesture, and sound. Multiplayer online games commonly represent a world very similar to the real world. However, virtual worlds are not limited to games; they can encompass computer conferencing and text-based chat rooms. Persons who interact and forge new forms of selfhood and society in virtual worlds are creating a virtual culture. One of the earliest virtual world experiences can be traced back to 1968 when the first virtual reality (VR) and augmented reality (AR) head-mounted display system was invented at Massachusetts Institute of Technology. In 1972, role playing was born when Dave Arneson and Gary Gygax created the first set of rules for Dungeons and Dragons. In 1974, the first networked, 3D multi-user first person shooter game, Maze War, was invented. Maze was the first game to include the concept of online players as eyeball “avatars” chasing each other around in a maze. Then in 1978, MUD (multi-user dungeon) was released as the game that could be played by everyone. Other games such as SimCity, Cybertown, and Second Life were also very popular. In 1998, inside Cyberspace, the world’s first online, graphical multi-user cyber-conference was held in multiple virtual worlds platforms and with multiple physical “nodes” on five continents. 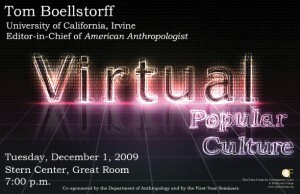 Tom Boellstorff, Ph.D., is professor in the Department of Anthropology at the University of California, Irvine, and editor-in-chief of American Anthropologist, the flagship journal of the American Anthropological Association. His research projects have focused on questions of virtual worlds, sexuality, globalization, nationalism, language, and HIV/AIDS. He is the author of The Gay Archipelago: Sexuality and Nation in Indonesia (Princeton University Press, 2005), winner of the 2005 Ruth Benedict Award from the Society of Lesbian and Gay Anthropologists; A Coincidence of Desires: Anthropology, Queer Studies, Indonesia (Duke University Press, 2007); and Coming of Age in Second Life: An Anthropologist Explores the Virtually Human (Princeton University Press, 2008). He is also co­editor of Speaking in Queer Tongues: Globalization and Gay Language (University of Illinois Press, 2004), co-editor of a theme issue of Ethnos, “Bodies of Emotion: Rethinking Culture and Emotion through Southeast Asia” (Volume 69:4, 2004) and co-editor of a theme issue of Anthropological Forum, “East Indies/West Indies: Comparative Archipelagos” (Volume 16:3, 2006). He is the author of publications in many journals, including American Anthropologist, American Ethnologist (twice), Cultural Anthropology, Annual Review of Anthropology, Journal of Asian Studies, Law and Society Review, PoLAR: The Political and Legal Anthropology Review, Journal of Linguistic Anthropology, Games and Culture, and GLQ: A Journal of Lesbian and Gay Studies (three times). He is also a core faculty member for the Culture and Theory Ph.D. program at Irvine, as well as a program faculty member for the Arts, Computation, and Engineering graduate program. He has worked as a consultant for the Intel Corporation, and sits on the advisory boards of two community-based HIV/AIDS organizations in Indonesia (Gaya Nusantara in the city of Surabaya (East Java province), and Gaya Celebes in the city of Makassar (South Sulawesi province).